How talent development is driving the region’s economic competitiveness was the topic of an economic development forum held recently at The University of Texas-Pan American. Rose Benavidez, president of the Starr County Industrial Foundation, attended the forum, which was held for the North American Advanced Manufacturing Research and Education Initiative Core Leadership Team. The forum opened with remarks from UTPA President Robert S. Nelsen, who serves as NAAMREI chair. Nelsen said there is a lot of magic in the “Magic Rio Grande Valley.” And that magic is its people. “The magic in the Valley isn’t agriculture. It isn’t the citrus industry,” Nelsen told the audience of economic development, workforce, education and manufacturing leaders. “It isn’t even manufacturing,” he added. Since its inception 10 years ago, NAAMREI has focused on building a talent pipeline that runs through the Rio South Texas region. Developing that talent network was the organization’s first step in creating an advanced manufacturing infrastructure for the seven county border region. “Talent and innovation are what drive global competitiveness for advanced manufacturing,” said Wanda Garza of South Texas College, executive director for NAAMREI. More than 60 private and public sector groups form the NAAMREI alliance, which includes economic development organizations, manufacturers, workforce agencies, public schools, community colleges, universities, and city and county governments. But having a well educated and trained workforce also creates challenges, explained Keith Patridge, president of the McAllen Economic Development Corp.
Patridge said the solution is to “train them here” and “keep them here” by providing high skilled, high paying jobs in advanced manufacturing. “When you look at manufacturing and think of it from an economic standpoint, it is one of the few sectors where they ship money in and products go out. The money stays here,” Patridge said in explaining why NAAMREI leaders chose to focus on advanced manufacturing as a way to transform the region. Patridge reported that a NAAMREI delegation recently met in Washington, D.C., with leaders from President Barack Obama’s Advanced Manufacturing Partnership and the National Institute of Science and Technology. The new AMP initiative, announced in June, is a national effort to bring together industry, universities and the federal government to invest in emerging technologies to create high quality manufacturing jobs and enhance the nation’s global competitiveness. “They are looking for something that will transform our economy,” Patridge said, adding that NAAMREI has a head start on what is needed to create manufacturing jobs. For the past 10 years, Patridge said NAAMREI partners have been setting the stage for public/private collaboration to create the next generation infrastructure for innovative advanced and rapid response manufacturing. He defined rapid response as taking an idea to the market place in as short a time and at as low a cost as possible. NAAMREI’s next step is to create a world-class research and education park that will be built in McAllen. With the master plan nearing completion, the NAAMREI delegation was able to show the Washington group that Rio South Texas has positioned itself to be a world leader in advanced manufacturing. Patridge said the Washington leaders, who were joined by U.S. Congressman Ruben Hinojosa, spent three and a half hours with the NAAMREI team, an indication of their interest in what the delegation had to say. “What they saw (about NAAMREI) was extremely important to them,” Patridge said, adding that the Washington group was impressed with NAAMREI’s achievements and future plans. “We were the first to come with an answer,” he said, noting that the NAAMREI delegation was able to convey its focus on manufacturing and outline plans for the research and education park. The park will be built on 400 acres of private and public land located in south McAllen near the foreign trade zone. It will also be an economic hub that will connect to a network of over 40 industrial parks in the Rio South Texas region. For more information on NAAMREI, call (956) 872-2770, or visit www.naamrei.org. 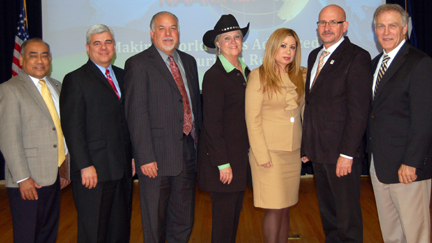 Photo cutline: Shown at the NAAMREI Economic Development Forum are, from left, Blas Castaneda, chief external affairs and special projects officer for Laredo Community College; Raudel Garza, Rio South Texas Economic Council executive director; Jack Damron, Region One ESC executive director; Wanda Garza of South Texas College, NAAMREI executive director; Rose Benavidez, Starr County Industrial Foundation president and vice chair of the STC Board of Trustees; Dr. Robert S. Nelsen, president of The University of Texas-Pan American and NAAMREI chair; and Keith Patridge, McAllen Economic Development Corp. president.